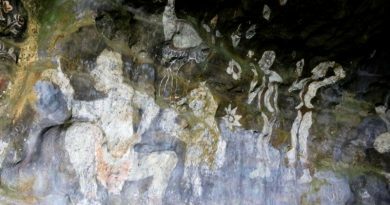 AS Khao Kho in Phetchabun Province is 700 meters above sea level it is ideal for growing macadamia trees which flower at 10 to 20 degrees Celsius temperature and this led to the Hmong hill tribe people living there starting to grow this particular tree on seven rai of land sometime ago, Thai News Agency said today. With greater acceptance of macadamia nuts, both fresh and roasted, these hill tribe people gradually increased production to 15 tons a year after studying the transformation process at Naresuan University. They won the five-star Otop award in this province this year with this being the highest honor. Because of increased marketing of macadamia nuts to restaurants, bakeries and people who are health conscious, this group of Hmong hill tribe people have now applied to the Bank of Agriculture and Agricultural Cooperative for a loan to improve the nut transformation site and drying room because these nuts do not like the sun with breeze needed to dry them. Thailand is one of few countries in the world suitable for growing macadamia nuts and has uplands to grow them in with these, aside from Phetchbun, being in Chiang Mai, Chiang Rai, Nan, Tak and Chaiyaphum. Because these trees can only be grown in certain areas the nuts fetch a good price of 420 baht a kilogram. Macadamia is a genus of four species of trees indigenous to Australia and constituting part of the plant family Proteaceae. They are native to north eastern New South Wales and central and south eastern Queensland, Wikipedia.com said. The first commercial orchard of macadamia trees was planted in the early 1880s by Rous Mill, 12 kilometers southeast of Lismore, New South Wales. Besides the development of a small boutique industry in Australia during the late 19th and early 20th centuries, macadamia was extensively planted as a commercial crop in Hawaii from the 1920s. Outside of Hawaii and Australia (35.200 metric tons -2013), macadamia is also commercially produced in South Africa (37.000 metric tons – 2013), Brazil, California, Costa Rica, Israel, Kenya, Bolivia, New Zealand, Colombia, Guatemala and Malawi. Australia is no longer the world’s largest commercial producer – the total world production for the 2013 year amounted to approximately 135,000 tones of nut in shell per year produced globally. 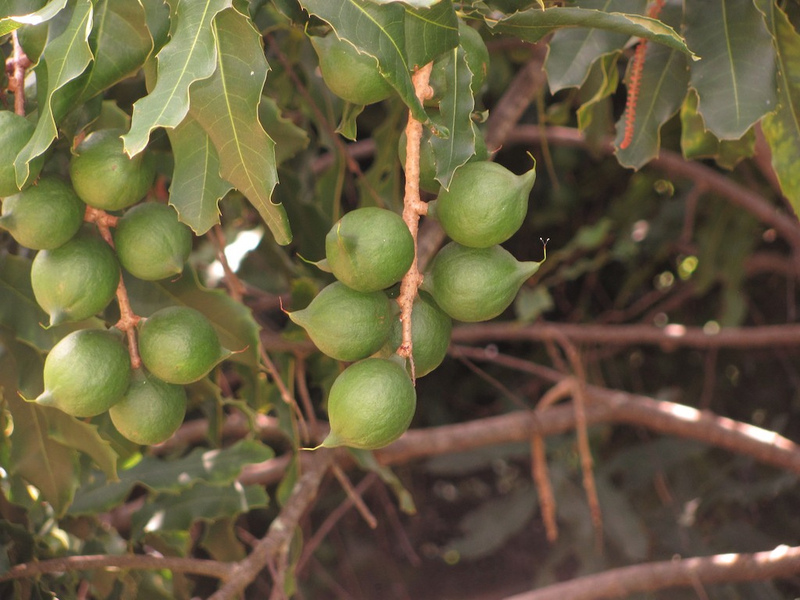 To date, efforts to grow the macadamia commercially in Florida have not met with success, primarily as a result of low yield. 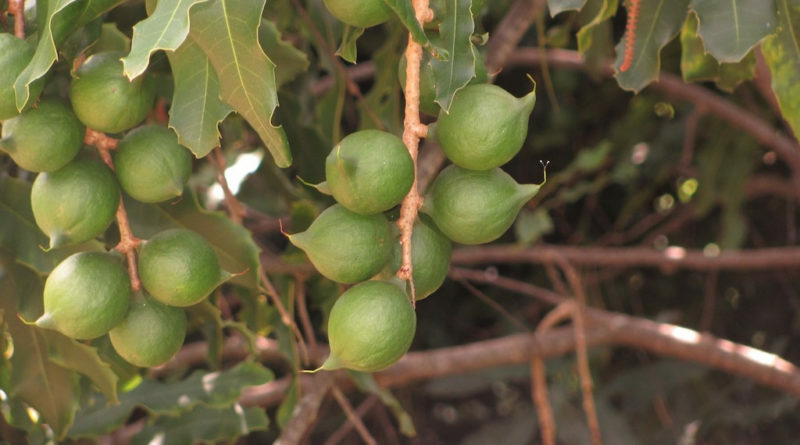 However, the macadamia is a popular dooryard tree in Florida and efforts to select cultivars with better productivity are ongoing, Wikipedia.com said. ← Enjoy bespoke cocktails on Phi Phi beach!